What makes Richardon Hobbing Machines from EMAG Unique? Therefore, the key question is how to ensure flexibility in the machining process of large parts? EMAG provides a complete answer to this question with its R 200, R 300, R 400 and R 500 hobbing machines. The “R” stands for Richardon. The name and the associated technology have been under the ownership of EMAG for the last year, allowing the group to expand its expertise to include gear cutting of large components. The R200, R 300, R 400 and R 500 hobbing machines are the primary solutions for this technology. They have the flexibility mentioned because they are able to machine a wide range of components, quickly – from spur gears, worm gears and rotors to bevel gears. Two features make this possible: a large machining area and workspace, and a wide range of speed and performance capabilities. 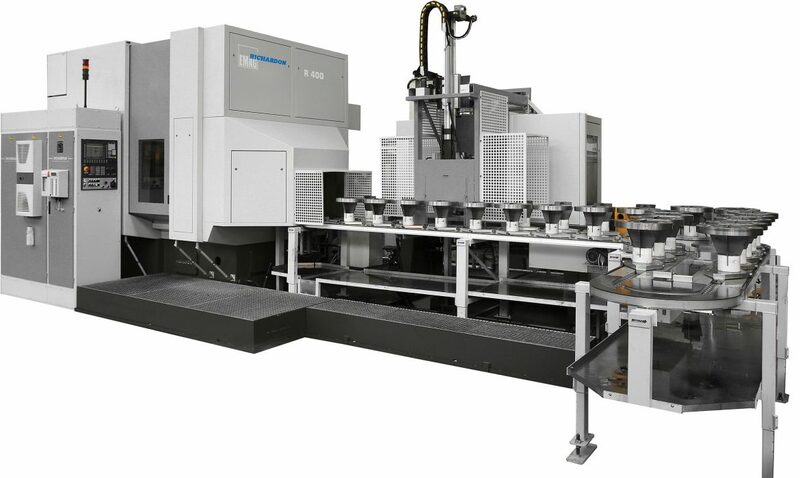 These features allow the R 500 machine, for example, to machine various components up to module 12 with workpiece diameters ranging from 20 to 700 millimeters—a truly remarkable range. The fact that the large machining area leaves room for the integration of secondary processes, such as deburring, cleaning, brushing, drilling or re-turning, ensures a high degree of productivity in the overall process. These processes are performed in rapid succession along with gear hobbing, resulting in multi-functional hobbing machines. The “duoMobil” customized loader technology compliments this technology. This solution features not just two autonomous NC loading axes and an NC axis for the steady rest slide, but also an extra large travel path of 800 mm. This means that, similar to the machine, the loader can accommodate components of various sizes. Alternatively, robot or portal systems are available. The high-quality components don’t just stop with the technology – we’ve carried this standard through the entire machine. The main assembly, for example, is thermally stable and made from high-quality cast iron, which ensures vibration reduction. Another outstanding quality feature is the impressive double V guideways on all axes. The result: In the last 20 years, not a single guide has ever been replaced or refurbished. Each of these hobbing machines is produced in the Richardon Service Center located in the EMAG plant in Eislingen. Without exception, the specialists design special solutions that are customized, flexible and feature outstanding performance values and a long service life.